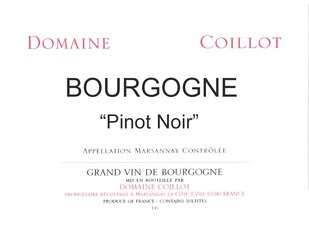 Wine Domaine Coillot Pere et Fils Bourgogne Rouge 2016 - Royal Wine Merchants - Happy to Offer! Bright ruby coloring, full and luminous. The nose is powerful, delivering notes of spice and small red fruit. Good mouth feel-ample, frank and well-constructed, supported by the strong tannins which give this vintage excellent volume. Beautifully fresh.